The governance structure of the UAKN operates as a Network Council (See Table 1). The purpose of the Network Council is to 1) determine strategic direction and priorities; 2) advise on knowledge mobilization and stakeholder engagement; 3) assess the Network Council’s accomplishments; and, 4) to contribute to fundraising. More specifically, the Network Council has articulated broad research themes that guide UAKN research and knowledge mobilization activities, and ratify UAKN reports and policy documents. Monitor research quality and the appropriateness throughout the research project. The Network Council is the national governing body for the Urban Aboriginal Knowledge Network (UAKN) co-chaired by the National Association of Friendship Centres (NAFC) and the academic principal investigator (SSHRC Partnership Grant). The UAKN consists of five essential structures that undertake planning of national level research projects, stakeholder engagement, research, knowledge transfer, and fundraising. The five structures are the Network Council, Aboriginal Circle, Funders’ Table, Regional Research Centres’ Table and the Secretariat. In addition, the Network Council provides guidance to the UAKN as a whole. The Funders’ Table provides an opportunity for organizations or departments that provide financial support to the Network to participate in the Network governance, priority-setting, and on-going activities. The Funders’ Table ensures that additional funds are appropriately instituted, provide input on research priorities, and work with the Network Council on financial matters of additional contracts brought in through the Funders’ Table. The Funders’ Table was established in conjunction with the three other components of the Network Council (i.e. Aboriginal Circle, Secretariat and Regional Research Centres) in early governance development. The Aboriginal Circle is comprised of Aboriginal persons from throughout Canada who are leaders and respected in their communities. The Aboriginal Circle also provides guidance in matters of ethical and cultural relevancy with respect to the research processes instituted by the UAKN. The Aboriginal Circle was established in conjunction with the three other components of the Network Council (i.e. Funders’ Table, Secretariat and Regional Research Centres) in early governance development. 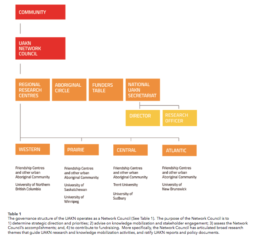 The UAKN Secretariat provides leadership and support in managing the Urban Aboriginal Knowledge Network’s (UAKN) governing structures and the activities of the UAKN, including the Aboriginal Circle, Funder’s Table, Regional Research Centres and the Network Council. The Secretariat is housed in the National Association of Friendship Centres (NAFC) office and is responsible for project management and administration. It provides leadership in managing the Network Council’s strategic directions; assists Regional Research Centres and other UAKN governing bodies in executing their responsibilities; performs national knowledge mobilization and transfer; and ensures that communication and best practices inform all UAKN endeavours. Research processes, over the last ten years, have changed to fully encompass Indigenous partners. For many years research undertaken by academic institutions served to benefit the academy and selected scholarly groups. Aboriginal peoples (Tuhiwai-Smith, 1999; UATF, 2007; Wilson 2008; Kovach, 2009; OFIFC, 2012) created a shift in thinking concerning the acquisition of knowledge, the process of research and how seeking knowledge, as it applies to academic research, can benefit both the academic scholar and the Aboriginal community. The UAKN is an example of how the research paradigm shift can be carried out in practice. Research undertaken through the UAKN is premised on implementing meaningful change at the community level. The Guiding Ethical Principles encompasses an acknowledgement of community ethics concerning research. It is further recognized that this document is a small iteration of the many Indigenous ethical protocols currently in existence.